Since the development of WRAP over fifteen years ago by a group of people who experience mental health difficulties, I have worked with others to develop various examples of how WRAP can be adapted for different uses. We have one for WRAP for Addictions, WRAP for Kids, Youth WRAP, WRAP for Trauma, and WRAP for Veterans and People in the Military. We also have one for using WRAP and Peer Support. I have recently completed Family WRAP. One of the most important books I have written is Winning Against Relapse. I am now in the process of updating and rewriting it and it will soon be out with a different title (became WRAP for Life). The new book will be an in-depth description of how WRAP can be easily adapted for many different purposes. It will contain lots and lots of ideas for Wellness Tools and action plans. I often get calls or emails from people these days wanting to know if I have developed a WRAP book for some specific purpose like stopping smoking, losing weight or gaining weight, dealing with chronic lung disorders or kidney disease. I always give the same response. I let people know that although I may not have developed a WRAP prototype for their specific need, WRAP is infinitely adaptable for any use and each person, couple, group, family, organization, or agency that decides to, or needs to develop a WRAP can develop one to meet their own needs. WRAP provides the guidelines—YOU provide the input. It’s as easy as that. Whatever your need is, the first step in developing a Wellness Recovery Action Plan is developing a list of all the possible resources you could use to address that need, your Wellness Toolbox. Spend plenty of time working on that. 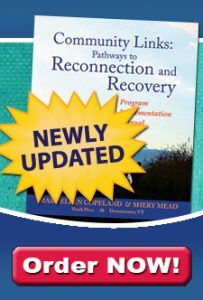 Winning Against Relapse and other books, articles and resources I have developed will give you ideas. Ask other people for suggestions. Then make a list of descriptive words or write a paragraph or more that describes how you want things to be if they are the way you want them to be: things like you would weigh 150 pounds, you would not smoke, your family would be getting along well, your group would be benefiting from each session. Next make a list of things from your list of Wellness Tools that you need to do every day to keep things the way you want them to be or to support you in working toward your goal. Include weekly or monthly lists if they apply in your situation. Add a list of Wellness Tools you might need to use on any particular day. The next step is identifying Triggers, things that might happen to you that, if they did, would make you feel badly. Then make a list of Wellness Tools you would use to keep yourself feeling well or feeling better quickly if these things did happen. Make similar lists for Early Warning Signs and signs that Things are Breaking Down, again, with lists of those Wellness tools you think would help in these situations. WRAP also guides you through the process of developing a Crisis and a Post Crisis Plan. Every step is specific to your situation. It’s as easy as that. So you see, with the resources that have already been developed, and your own expert input, you can develop a WRAP that will meet your needs whatever they may be.